Based on the Keezhavenmani massacre of 1967 in which 442 Harijans were burnt to death in a landlord- peasant clash, author Indira Parthasarathy’s genuine portrayal of characters and incidents are the ultimate highlights of this novel. A novel, that makes you question the importance of revolutions and their vis-à-vis struggles. Parthasarathy’s bold narrative takes you back in time, as you jump through the pages to support the main protagonists, Gopal and Siva. It makes you ponder over the individuality associated with social movements, realizing that every revolution’s seed lies in the self-interest of its sufferers. Moving on to questioning if and whether revolutions and struggles can really even be inevitable? The book revolves around the interaction of forces between the haves and have-nots of rural India and of the confrontation of values when products of urban prodigality return to become agents of village messiahism. The author shows immense narrative talent throughout the book which reaches a crescendo in the last couple of pages. Take this, for instance, “Revolution shall never cease to be. If it ceases, it ceases to be a revolution.” An edge-of-the-seat thriller, carved in with a hard-hitting story is intelligently written and will instantly set you off to explore more. 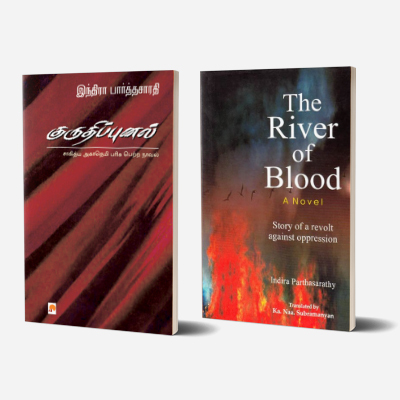 Indira Parthasarathy is the pen name of R. Parthasarathy, a noted Tamil writer and playwright. He is perhaps the only writer in Tamil to have won both Sahitya Akademi and Sangeet Natak Akademi awards. Born in 1930, Indira Parthasarathy is a scholar, creative writer, literary critic, cultural historian and thinker. During his long and distinguished career as an academician in Delhi University, is when he came under the influence of western literature. He has published 16 novels, 10 plays, anthologies of short stories and essays. Some of his stories have gone beyond the shores of India to Spain, France, Russia and the Middle East.